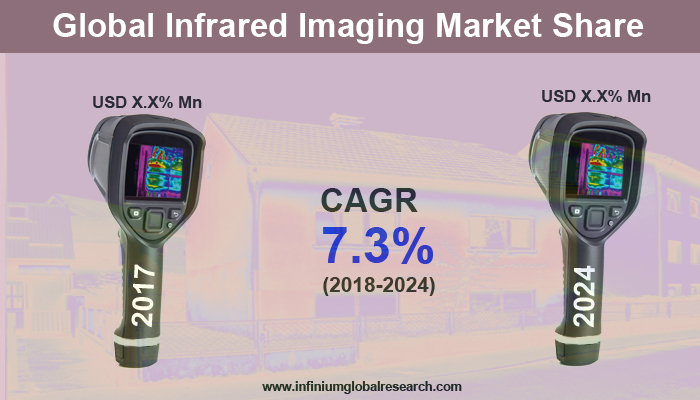 A recent report published by Infinium Global Research on infrared imaging market provides in depth analysis of segments and sub-segments in global as well as regional markets of infrared imaging market. The study also highlights the impact of drivers, restraints and macro indicators on the global and regional markets of infrared imaging over the short term as well as long term. The report is a comprehensive presentation of trends, forecast and dollar values of global infrared imaging market. According to report the global infrared imaging market is projected to grow at a CAGR of 7.3% over the forecast period of 2018 - 2024. Development of micro bolometer which is used as a detector in thermal cameras is driving the growth of infrared imaging market. Additionally, rise in demand of high speed infrared cameras with advanced features and rise in implementation of military application under soldier modernization programs are significantly driving the growth of the market. However, high cost of infrared imaging market is restraining the growth of the market. Moreover, infrared imaging products in security and surveillance, and monitoring and inspection applications are providing several growth opportunities for the infrared imaging market over the upcoming years. Companies such as Axis Communications AB and Samsung Techwin are some of the major key players in the line of infrared imaging market. The report on global infrared imaging market covers segments such as type, component, technology and application. The type segments include portable and fixed. On the basis of component the global infrared imaging market is categorized into IR detectors, IR lens systems IR sensors and other. Furthermore, on the basis of technology the infrared imaging market is segmented as uncooled and cooled. On the basis of application the infrared imaging market is segmented as medical, automotive, consumer electronics, firefighting, aerospace & defense and surveillance. The report provides profiles of the companies in the global infrared imaging market such as, Bosch Security Systems, Inc., Axis Communications AB, Zhejiang Dali Technology Co., Ltd., Sofradir Group, L-3 Communications Holdings, Inc. , DRS Technologies, Inc., Flir Systems, Inc, Opgal Optronics Industries Ltd., General Dynamics Mission Systems, Inc., and Fluke Corporation. The report provides deep insights on demand forecasts, market trends and micro and macro indicators. In addition, this report provides insights on the factors that are driving and restraining the global infrared imaging market. Moreover, IGR-Growth Matrix analysis given in the report brings an insight on the investment areas that existing or new market players can consider. The report provides insights into the market using analytical tools such as Porter’s five forces analysis and DRO analysis of infrared imaging market. Moreover, the study highlights current market trends and provides forecast from 2018 to 2024. We also have highlighted future trends in the infrared imaging market that will impact the demand during the forecast period. Moreover, the competitive analysis given in each regional market brings an insight on the market share of the leading players. Additionally, the analysis highlights rise and fall in the market shares of the key players in the market. This report will help manufacturers, suppliers and distributors of the infrared imaging market to understand the present and future trends in this market and formulate their strategies accordingly.